Make the Most of Today's Smallest, Fastest Desktop Linux Distribution-Damn Small Linux!Damn Small Linux (DSL) is a super-efficient platform for everything from custom desktops to professional servers. Now, DSL's creator and lead developer have written the first definitive, practical guide to this remarkable system. 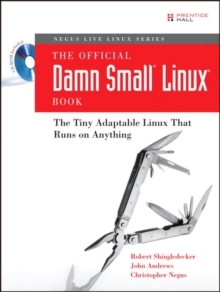 The Official Damn Small Linux Book brings together everything you need to put DSL to work in just minutes. Simply learn a few essentials, boot the live CD-ROM, and master the rest...one step at a time, hands-on. If you're new to Linux, you can quickly discover how to use DSL to take your data on the road, safely running your programs and personal environment on nearly any computer. Easily adapt DSL to run on anything from an alternative device (Internet appliance, hand-held, diskless PC, or mini-ITX system) to an older PC that might otherwise be headed for landfill. Use this book and CD-ROM package toRun DSL at blazing speed, from CD, USB pen drive, or directly from RAM Run DSL from your hard drive or in a virtual environment within Windows Add applications and create shareable extensions Customize and remaster DSL to create your own distribution Build a complete music and multimedia server Use Skype VoIP phone service in DSL Quickly set up an XAMPP Web server, complete with MySQL, PHP, and Perl, to host your personal Web pages CD-ROM IncludesSeveral versions of Damn Small Linux that let you run DSL directly from the CD, a Windows desktop, a pen drive, or your PC's RAM. Software packages (MyDSL extensions) including everything you need to create an Edna music server, Skype (R) VoIP calling client, multimedia picture frame, and tiny XAMPP Web server. Tools for rebuilding and remastering Damn Small Linux. Your Practical, Hands-On Guides to Getting Real Results with Free Software Every book in this series encourages and challenges you to advance in the free software world. Boot the accompanying live DVD or CD and watch the Linux system, applications, and content described in the book come to life. When you finish, you'll know how to use, customize, and rebuild that open source software. Start as a novice, by trying out examples...and finish as a professional!